Central Channel Passes, Pt. 2 – turning meh into yes!!!!!!!!!! So….what did you think? Yes, I know small sample size & I tried to make that clear in the post. If this is to turn into a bigger study, I needed some proof that it would be worthwhile & I also wanted to be transparent with the process so if others wanted to research this – they could (& hopefully they would share with the masses – so we can see if there is some validity here). Since I published the first post I have been thinking that honing in on Shooting Percentages off of Central Channel passes would be the best way to measure how dangerous this kind of play is. When a shooter misses the target, we have no way of knowing how dangerous the shot was…because well, he missed. But look at the exasperated relief in the goalie before…the shot missed the target – which brings down the Conversion Rate – but it sure looks as if the shot had been on goal we’d be watching the ball go into the back of the net. The body language of the goalie says it all. It also inspired me to reach out to a couple of goalkeepers for their take on these kinds of plays. 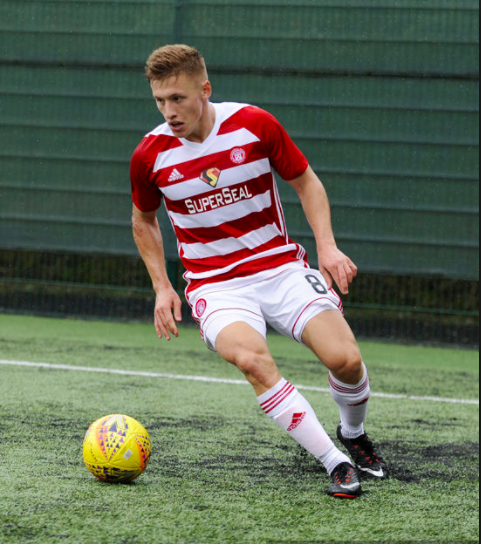 So far, I have heard back from one keeper who plays professionally in Scotland & his insight adds a real valuable narrative to the stats provided in these posts….that will be shared in part three. The image above represents how I identified the Central Channel for this brief study. The white space reflects the channel, whenever a pass crossed it leading to a shot (within 1-2 seconds of getting the ball) I counted it as a Central Channel Pass. I also created 14 zones to help identify trends in where passes & shots are coming from. Remember, I only looked at three teams: Rangers, Motherwell & Hamilton. This is only a snapshot…not a full blown study. All of the shot statistics in this post are Fenwick Adjusted…basically, I will only be looking at unblocked shots. So, Conversion Rates, Shot Accuracy, shot totals, etc…will only include unblocked shots. There are few things Scottish football fans like more then a good ball into the box that is met by a thunderous header on goal. They like players who know how to “battle” & strikers who can rise above the masses & power a cross past the goalie with his noggin. My earliest footballing memory is this Richard Gough goal for Scotland against England back in 1985 (yes, I’m an old). But notice where he rises above & flings the English defender to the pitch from the shear power of his ginger head….yeah, it’s right there in the six yard box. Headers from there score at a pretty high rate. In the Scottish Premiership, 25% of unblocked headers from this location have beaten the keeper. That’s why I include those in my category of Scoring Chances. Guess what happens to the Conversion Rates of headers as they move back towards the heart of the box? The Conversion Rate drops all the way down to 10%…that’s not good. But you still have teams who seem to build their attack around…getting the ball to the wing & flinging a cross into the heart of the box for the forward to channel his inner Mark Hateley…& watch that plan fail 90% of the time (& that’s only counting the times the good guy gets his head on the ball). Reminder, only unblocked shots are included. Rangers (! 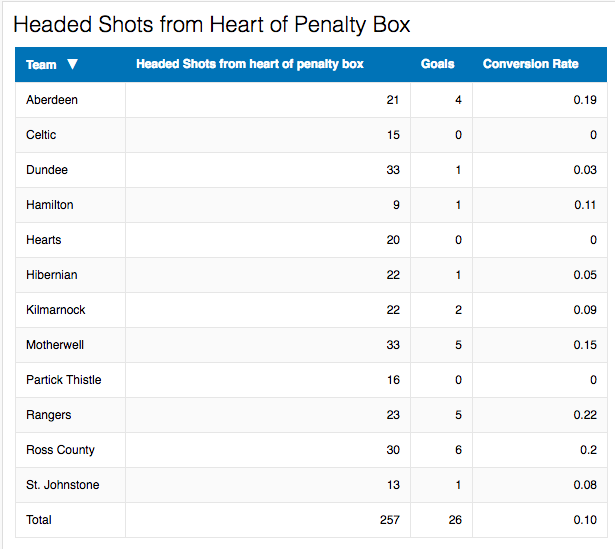 ), Ross County, Aberdeen & Motherwell are the only clubs finding any real success on headers from the heart of the box. Now let’s compare these success rates to the Conversion Rates on kicked shots from the heart of the box. I’ve added a column that shows the difference in Conversion Rates between kicked shots & headed shots. Overall, 27% of unblocked shots from this area beat the keeper for goals, while only 10% of headed shots do. For every ten shots thats a difference of nearly three goals (2.7) compared to one. 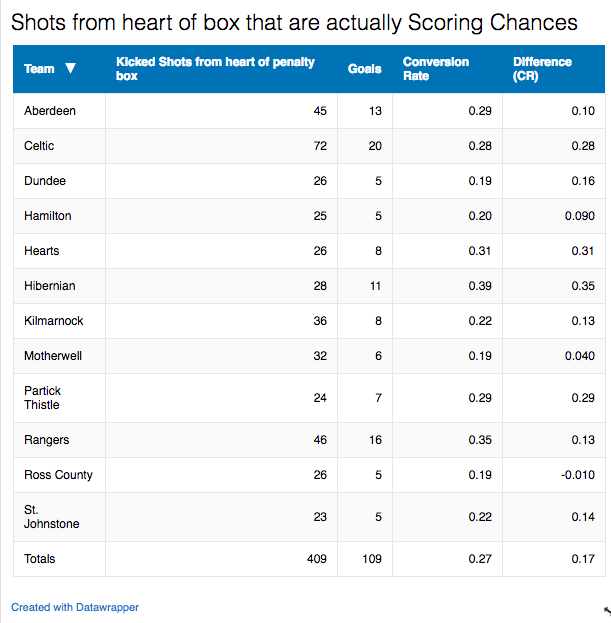 We are….the above is what we call “context.” Headers from the heart of the box have not been a successful approach for most teams in the SPFL this season. But…remember those clubs who are actually doing OK? Two of them were Rangers & Motherwell…teams from our little study. Let’s peal back some layers. In both cases, you see a noticeable spike in Conversion Rates when the ball to the shooter crosses the Central Channel. Headers from passes that crossed the Central Channel were 3x as likely to score with a Conversion Rate of 36% & look at that Shooting Percentage. Of the Central Channel shots that were on target, 71% beat the keeper for a goal. And, who could forget this one? Ultimately, we can’t make any real conclusions of whether these plays turn shots that fail 90% of the time into legitimate scoring chances based on a study this size. However, those differences (36% compared to 12%) & (71% compared to 43%) should be one, huge green light to take this kind of research to a that next level. Because, if those rates pan out over a bigger study – then you have created a real & tangible tactical advantage that could win you games. How & where are teams getting their Central Channel Shots? In a bigger study, I think you could really hone in on what kinds of Central Channel shots are the most dangerous? Even though I didn’t track many shots from Zones 2 to 3, or 14 to 2….but in a study that includes hundreds of matches maybe we would find out that those kinds of passes turn normally harmless shot locations into a real threats? For now, here are the most popular Central Channel combos from each team. 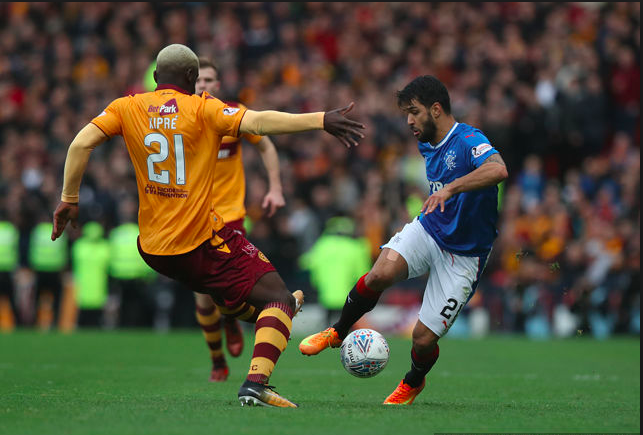 No surprise here that right side was the starting point for the most Cross Channel passes considering the exploits of Daniel Candeias & James Tavernier this season. In fact, 30% of all Cross Channel passes originated from Zone 5, while 20% came from Zone 1. Zone 3 (17%) & Zone 2 (13%) were the other outliers. They actually had no trend as noticeable as Rangers when it came to Central Channel combos, with no combination higher then 10%. However, 25% of the passes originated from Zone 1, 20% from Zone 5 & 15% from Zone 3. Zones 1 & 5 are the stomping grounds of Chris Cadden & Richard Tait. The only Central Channel combo higher then 10% for Hamilton was from Zone 2 to Zone 3 (17%). 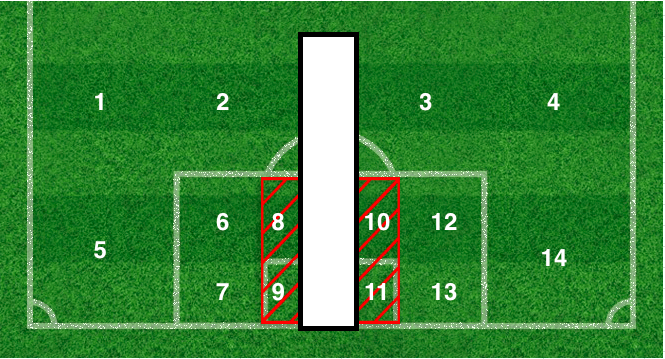 Passes came from mostly from Zone 2 (30%), Zone 3 (17%), & Zone 5 (13%). It’s interesting that Hamilton seems to be deliberately making these kinds of passes from the top of the box & are less reliant on width as Rangers & Motherwell. The following players led the way for each team in completing Central Channel passes that led to shots (Central Channel Key Passes). In the next part of this series we will hear a goalkeeper’s reaction to this data & we will discuss what are next steps moving forward.